Scientific Management was the product of 19th Century industrial practices and has no relevance to the present day. Adam Smith was the first person who developed the theory of Scientific Management in 1800. He was the first person who broke the tasks into sub tasks to carry out the work in the factory where he was working. To the surprise, the labour that used to make 20 pins a day produced around 4800 pins a day. Later in the 19th century, Frederick Winslow Taylor devised the scientific management in order to improve the productivity of labour by analysing the process of workflow (Wrege, C.D. (2008). Frederick Taylor was termed as the father of scientific management and also the scientific management was termed as Taylorism due to his contribution in understanding the workflow process in the factories. Though he contributed the maximum, but there were others like Gantt and Gilbreth who also contributed to the theory of scientific management. Technically speaking the scientific management is the concern related with the efficiency of the worker working individually. However according to the George Ritzer scientific management is a nonhuman procedure and have used their control on the workers. Before Taylorism, it was only one rule that was followed by all business that was “rule of thumb”; here the worker was responsible for taking the initiative and also control of the work therefore the results of success and failure were because of his hard work. However, according to Taylor, the rule of thumb was not sufficient and with his studies of his work place he concluded that there is only “one best way”. (Kanigel, R.1997). That one best way was that he wanted to divide the work among the workers and the employees and give specific task to each labour and expected them to do that particular task constantly. According to him it was the best method that should be adopted by the employees and will also create a best job. ( Wrege, C.D. (2008). Logically speaking, his adoption of this method was correct, as over the time, the repetition of task will have good productivity and also the quality will also improve gradually. Taylor believed in bottom up approach in the organisation where the motivation is only for the shop floor workers so that they can increase the productivity and quality of work whereas according to Henry Ford, in his organisation the structure was top down where the aim was to motivate and improve the management’s top section. ( Chandler, A.D., Jr. 1990). Taylor carried out the experiment on the workers where he broke the task by redesigning the work flow. He asked the workers to load the bars of iron the on the open rail car. By redesigning and breaking the task, the workers were able to load 47.5 tons of bar each day instead of 12.5. He therefore mentioned that the people are just motivated by money and nothing else. At this time he started the new structure in the organisation which was called “fair days wage based on fair days work”. (Kanigel, R. (1997). According to him, workers will be paid extra only when the output is more from them and also they will get bonus only of completing the targets. It was Gilbreth who supported the ideas of Taylor and gave his input as well in increasing the efficiency and output of the employees. Henry Gantt and Henry Ford gave the new definition the scientific management. They humanized the scientific management. According to Gantt it is important to consider the employees physiological needs. In his theory of scientific management, he did not went in to the details of the deskilling the employees though he followed the one best way method of Taylor. (Sharples, M. & du Boulay, G.H. 2002). According to him, each worker should be given standardised wages and also the bonus. He also made a plan of work that was useful to the managers as well as the employees. Further later, Henry Ford gave new meaning to the scientific management his principles were later referred as Fordism. Henry Ford was the owner of the card company Ford. Ford proposed that the mass production is effective with the help of assembly line technology as the work is further more divided among the labour. (Chandler, A.D., Jr. 1990). Before this theory it used to take lot of time to complete the task as the work force was limited. The management’s method was to produce the products in mass with the help of assembly line. The assembly lines speed determined the speed of the workers. Henry Ford’s approach to scientific approach was more technological where he humanized the work whereas Taylor’s approach to scientific management was to motivate the lower staff and increase the productivity. However, at the later stage, Taylor’s theory was criticized by many business houses as well as the authors as he treated the workers as robots and was inhuman with them. Ford’s theory was widely accepted by the industries and is still practised. It will not be correct to say that the scientific management is not applied these days in the industry. It is very much sustained by the industries these days as well. One of the biggest users of scientific management in this era is Mc Donald’s. This is an American chain of fast food and is present worldwide. They work on the principle of Ford that is they follow the approach of assembly line. The restaurants are designed in such a way that the employees do not take more than two steps to complete their task. All the restaurants worldwide are made on the same concept. Mc Donald had used the concept of assembly line to the fullest and also kept in mind the lean operations to avoid any kind of waste. They have placed there machineries in such a manner that the wastage is mitigated. (Sharples, M. & du Boulay, G.H. 2002). Mc Donald had not only adopted the style of Henry Ford but also of Taylor as at the restaurants each task has been broke into sub tasks like making a chicken burger, where the burger is grilled, next is to place lettuce and vegetables, adding sauces, adding cheese and wrapping it at last. By doing this, the workers efficiency is increased and the standards are maintained throughout the stores. The usage of other machineries like French fries machine, dispensers for drinks, etc are used to finish the task in a productive manner, they are all adopted from the theories of Taylor and Ford of scientific management. Therefore it is not wrong to say that the principles of scientific management are accepted in today’s century as well and are not past history of 19th century. However, it is criticized by people as the workers who are well skilled did not get the chance to show their skills as they had to do same task over and again. Doing only one task repeatedly makes the job boring for the employees as they lose the motivation and therefore work half heartedly. Another place or industry where the scientific management is successfully used is the call centres. Here the managers take the control of the employees for efficient work and great output with appropriate service. The managers record and listen to the conversations of their employees in order to keep the control on their work. This is the theory of Ritzer, where managers have a manager control on the employees. Even the wages methods in the call centre have been adapted from the Taylor’s theory of scientific management of fair wages. Here the employees are given basic salary and rest of the wages are paid depending on the sales they made for the company and even the bonus are based on targets achieved by the employees. Call centres have directly adapted the payment method from the Taylorism and are successful in implementing the same in this century. Apart from this supermarkets in retail sector and even the airports use the scientific management approach. Supermarkets works on the Taylor’s division of labour and airports work on the Ritzer’s principle where the control is over the people in the airport. In the 19th century Ford developed the approach of assembly line technology and is still been used by ford cars. Not only Ford but also Toyota works on the same lines though they have developed and enhanced the technologies. (Feld, W. (2000). It is therefore clear that scientific management is not the past and still holds the relevance in the industries and other places. Though the technologies have enhanced tremendously but the base line remains the same and that is the application of scientific management. 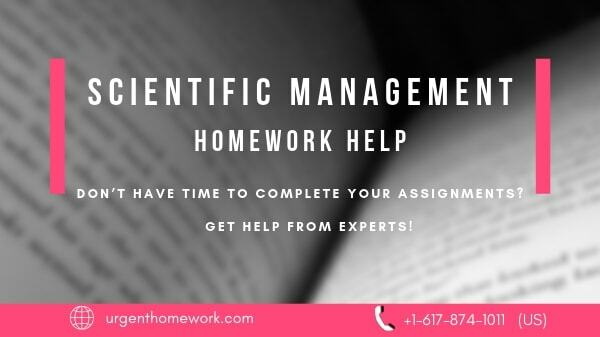 It is relevant from the above examples that the use of scientific management is still used however it has the limitations due to which the businesses these days are reluctant on using this approach of scientific management. The scientific management approach does not give job satisfaction to the employees and also de motivate them over the time period because they do the same job again and again though they are specialised in doing the job and also the results are good. (Derickson, A.1994). As per the hierarchy of needs money is the basic motivator for the workers and employees however there are other social needs that motivate the employee to work like job satisfaction, need for shelter and also the satisfaction of self contentment. ( Derickson, A.1994). This theory contradicted what Taylor had developed that people work only for money. Another theory that contradicted the approach of scientific management of Taylor was the human relation theory where Hawthorne proved that the social factors are also important for motivating the staff and also working in the groups which in turn will increase the output automatically. This theory is still been used in place of scientific management. The examples of places that use this approach are call centres where the working conditions are premium. Another example is food manufacturing industry, where people work in groups. Though the scientific management holds the relevance in this age yet there are number of reasons why the implementation in this century is difficult for the scientific management. In this world of competitiveness where the change is a must in order to remain in the competition, the scientific management holds the disadvantage because as per the approach each task is done by specialised person and in present scenario, the employee will get use to the same work and it will be difficult for them to resist the change. (Derickson, A.1994). Another reason is that people these days need recognising and also the value in the company as this helps them to climb the ladder of success in the company. If the Taylorism is applied employee’s skills will be ignored and they had to just perform the same work again and again this would in turn will de motivate the staff and hence the output of the efficiency will be affected. Also the physiological and social needs of the employees are not paid attention in this approach of scientific management whereas these days’ people look for sense of achievement rather than money as a motivator. (Toman, C. 2003). It would be appropriate to state that the scientific management has not lost its relevance in this age as well and are equally practiced as they were in 19th century. The scientific management is successfully implemented and used in various sectors of business; let it be food giants like Mc Donald or car manufacturing companies like Ford or Toyota or Suzuki. Though the style of practices has changed and also the technologies have enhanced yet to some extent the different principles of scientific management are practiced at different industries at different levels. The use of scientific management will be in the future as well as they play an important role in management. However the companies dealing with consumers will face challenges in implementing the scientific management as the consumer industry is all about the change. 2. Derickson, A. (1994). Physiological science and scientific management in the Progressive Era: Frederic S. Lee and the Committee on Industrial Fatigue. The Business History Review, 68: 483–514. 3. Feld, W. (2000). Lean manufacturing: Tools, techniques and how to use them. Boca Raton, FL: St. Lucie Press. 4. Kanigel, R. (1997). The One Best Way: Frederick Winslow Taylor and the Enigma of Efficiency. New York, NY: Penguin Books. 5. Sharples, M. & du Boulay, G.H. (2002). Socio-cognitive engineering: A methodology for the design of human centered technology. European Journal of Operational Research, 136: 310-323. 7. Wrege, C.D. (2008), F.W. Taylor’s Lectures on Management, June 4, 1907, Journal of Management History, 14: 209-213.